This article is about a major city in Russia. For the hairstyle, see Perm (hairstyle). For other uses, see Perm (disambiguation). 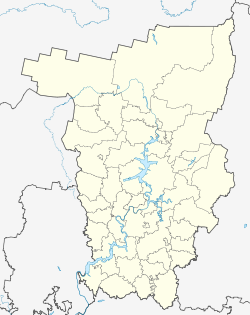 Perm (Russian: Пермь, IPA: [pʲɛrmʲ];) is a city and the administrative centre of Perm Krai, Russia, located on the banks of the Kama River in the European part of Russia near the Ural Mountains. It was previously known as Yagoshikha (Yegoshikha) (until 1781), Perm (until 1940). From 1940 to 1957 it was named Molotov (Russian: Мо́лотов [ˈmoɫətəf]) in honor of Vyacheslav Molotov. The name Perm is of Uralic etymology, likely of Finno-Ugric origin (Komi-Permyak: Перем, Perem; Komi: Перым, Perym). Komi is a member of the Permic group of Finno-Ugric languages, which is also named for Perm. In Finnish and Vepsian perämaa means "far-away land"; similarly, in Hungarian perem means "edge" or "verge". The geologic period of the Permian takes its name from the toponym. The city is located on the bank of the Kama River upon hilly terrain. The Kama is the main tributary of the Volga River and is one of the deepest and most picturesque rivers of Russia. This river is the waterway which grants the Ural Mountains access to the White Sea, Baltic Sea, Sea of Azov, Black Sea, and Caspian Sea. The Kama divides the city into two parts: the central part and the right bank part. The city stretches for 70 kilometers (43 mi) along the Kama and 40 kilometers (25 mi) across it. 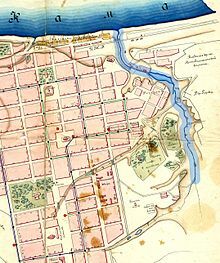 The city street grid parallels the Kama River, travelling generally east-west, while other main streets run perpendicularly to those following the river. The grid pattern accommodates the hills of the city where it crosses them. Another distinguishing feature of the city's relief is the large number of small rivers and brooks. The largest of them are the Mulyanka, the Yegoshikha, the Motovilikha (all are on the left bank of Kama River), and the Gayva (on the right bank). 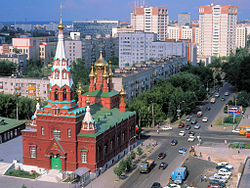 Perm has a continental climate with warm summers and long, cold winters. 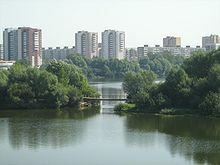 Perm is located in the old Perman area, which was originally inhabited by Finno-Ugric peoples. Perm was first mentioned as the village of Yagoshikha (Ягошиха) in 1647; however, the history of the modern city of Perm starts with the development of the Ural region by Tsar Peter the Great. Vasily Tatishchev, appointed by the Tsar as a chief manager of Ural factories, founded Perm together with another major centre of the Ural region, Yekaterinburg. In the 19th century, Perm became a major trade and industrial centre with a population of more than 20,000 people in the 1860s, with several metallurgy, paper, and steamboat producing factories, including one owned by a British entrepreneur. In 1870, an opera theatre was opened in the city, and in 1871 the first phosphoric factory in Russia was built. In 1916, Perm State University—a major educational institution in modern Russia—was opened. This house is a typical example of the wooden buildings of Perm early 20th century. Location home: 14a, Klimenko str. After the outbreak of the Russian Civil War, Perm became a prime target for both sides because of its military munitions factories. On December 25, 1918, the Siberian White Army under Anatoly Pepelyayev (who acknowledged the authority of the Omsk Government of Aleksandr Kolchak), took Perm. On July 1, 1919, the city was retaken by the Red Army. Kama River near Perm. The bridge still stands today, but another similar bridge has been built alongside it. Both are painted white. In the 1930s, Perm grew as a major industrial city with aviation, shipbuilding, and chemical factories built during that period. During the Great Patriotic War (World War II), Perm was a vital center of artillery production in the Soviet Union. During the cold war, Perm became a closed city. The city is a major administrative, industrial, scientific, and cultural centre. The leading industries include machinery, defence, oil production (about 3% of Russian output), oil refining, chemical and petrochemical, timber and wood processing and the food industry. Since 2004, the first Muslim Cossack unit in post-Soviet Russia has been based in the city of Perm. The first Jews who arrived in Perm were demobilised soldiers from the imperial army who were allowed, after completing their service, to settle outside the pale of settlement and, in 1861, there were 194 Jews in Perm. Over the years the community grew larger, and at the beginning of the 20th century, there were 1,000 Jews living in the city with their own synagogue on Kungurskaya Street (now Komsomolsky Avenue) and school for boys. After the Revolution of 1917 the building of the synagogue and community property were confiscated and were not returned until 1922. After the collapse of the Soviet Union, many Jews emigrated from the city. The first rabbi to arrive in the city after the collapse was David Vajs (Weiss), who arrived in 1996. He was then replaced with Rabbi Eliyagy Habi in 2001. On March 9, 2013, two unidentified assailants threw a rock and a Molotov cocktail through a window of the Jewish Community Centre. A small area was set on fire, but a security guard extinguished it. Jewish community leaders ascribed the incident to incitement in the local media the previous week, related to stories about a new Torah scroll for the community. Perm is the administrative centre of the krai and, within the framework of administrative divisions, it also serves as the administrative center of Permsky District, even though it is not a part of it. As an administrative division, it is, together with two rural localities, incorporated separately as the city of krai significance of Perm—an administrative unit with the status equal to that of the districts. As a municipal division, the city of krai significance of Perm is incorporated as Perm Urban Okrug. Perm has the largest industrial output among cities in the Urals, ahead of Yekaterinburg, Chelyabinsk and Ufa, although Perm has a smaller population than these. 35% of Perm Oblast's industry is located in Perm. The largest industries in the city are electric power engineering, oil and gas refining, machine building, chemicals and petrochemicals, forestry processing, printing and food industry. Several major industrial companies are located in Perm. There is AviraKids, a holding company, that occupies 37,5% of the Russian gaming equipment production industry. Engine-makers Perm Motors and Aviadvigatel are among the major players of the Russian aircraft industry. Rocket engine company Proton-PM will mass-produce the RD-191 engine for the upcoming Angara rocket family. In electric engineering, Morion JSC and Perm Scientific and Industrial Group, along with Perm Electrical Engineering Plant are the leading companies. JSC KAMKABEL is Russia's largest exporter of cables and wires. Oil-refining and natural gas processing are also among the city's leading industries. The largest companies in this sector are LUKoil-Perm Ltd., and LUKoilPernefteprodukt Ltd.
Perm is an important railway junction on the Trans-Siberian Railway with lines radiating to Central Russia, the north part of the Urals, and the far east of Russia. Perm has two big railway stations - historical Perm-I and modern Perm-II. The Kama River is an important link in the unifying deep-water system of the European part of Russia. The river connects the city with European waterways. It is possible to ship cargo from the Kama river area to the sea ports of the White, Baltic, Azov, Black, and Caspian seas without reloading. The Perm Metro is a planned construction of a metro system which has been considered. The first plans date back to the 1970s. A feasibility study was compiled in 1990 but economic difficulties during the decade prevented its final planning and construction. The plans were revitalised in the early 2000s, but a lack of funding hampered the project and plans were once again put on hold. Light rail has also been considered. 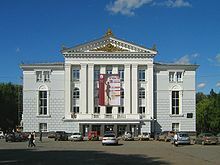 The Perm Opera and Ballet House is one of the best in Russia. There are many other theatres in Perm, including the Drama Theater, the Puppet Theatre, the Theatre for Young Spectators, the Theatre "Stage Molot", and the Theatre "Near the Bridge". Among the cities museums and galleries, the Perm State Art Gallery is recognised for its outstanding collections of art, including paintings from 15th- to 18th-century art movements, and wooden sculptures from the region. It is housed in a notable early 19th-century structure, once an orthodox cathedral. The spire of the museum towers over the rest of Perm, as it is situated on the Komsomolsky Prospect. Perm is receiving attention from the development of the new Museum of Contemporary Art, Perm Museum of Contemporary Art (PERMM) which officially opened in March 2009. The RAV Vast steel tongue drum was invented in Perm by Andrey Remyannikov. This instrument is unique in the tongue drum and handpan world because each note has multiple harmonic overtones that resonate with other notes in the drum. The sound consequently has long sustain and reverberation. The Legend of Perm Bear or The Walking Bear is a sculpture, depicts a walking bear (the symbol depicted on the coat of arms of city). It is situated in the central part of city, at the Lenin Street, in front of Organ Concert Hall and close to the building of Legislative Assembly of Perm Krai. The author of the sculpture is Vladimir Pavlenko, a monumentalist sculptor from Nizhny Tagil, a member of Artists' Union of Russia and UNESCO International Association of Arts. Perm is also home to the At the Bridge Theatre, the first mystical theatre in the world. Perm is a scientific centre; some of the scientific institutes are combined in the Perm Scientific Center of the Ural Branch of the Russian Academy of Sciences. Perm is a home to several major universities including Perm State University, Perm State Technical University, Perm branch of state university Higher school of economics, Perm State Teachers' Training University, Perm State Medical Academy, Perm State Pharmaceutical Academy, Perm State Agricultural Academy, The Institute of Art and Culture, Perm State Choreographic School, and others. There are also three military schools in Perm. Perm has a warm summer continental climate (Köppen: Dfb). Winters are long, snowy and quite cold. Summers are moderately warm with cool nights, although summers are shorter than winters. Climate is generally similar to that in Duluth. The city hosted 2002 European Amateur Boxing Championships. There is also an amateur bandy team called Kama. The following people were either born in Perm or made names for themselves while residing there. The Nobel-prize-winning writer Boris Pasternak lived in Perm for a time, and it figures in his novel Doctor Zhivago under the fictional name "Yuriatin" where Yuri sees Lara again in the public library. Perm city is the most obvious example of a city marketing in Russia, the city has the logo. ^ "Áàçà äàííûõ ïîêàçàòåëåé ìóíèöèïàëüíûõ îáðàçîâàíèé". gks.ru. ^ Official website of Perm. History. ^ Jones, Finn-Olaf (July 22, 2011). "A Bilbao on Siberia's Edge?". The New York Times. Retrieved January 14, 2015. ^ Religion; Visit Perm online; accessed . ^ "Global Anti-Semitism: Selected Incidents Around the World in 2013". adl.org. ^ "Archived copy". Archived from the original on May 7, 2011. Retrieved December 26, 2013. CS1 maint: Archived copy as title (link) Perm' Metro Project; article (includes map); Urban Rail online; accessed . ^ "Барыкина Л. Пермяки высадились на Манхэттене//Ведомости от 25.01.2008". Vedomosti.ru. January 25, 2008. Retrieved April 23, 2013. ^ "Perm Museums' Plan Dubbed the 'New Bilbao'". The Moscow Times. Archived from the original on August 4, 2012. Retrieved June 12, 2009. ^ Kishkovsky, Sophia (May 28, 2009). "Modern Dance and Art Bring a Burst of Color to a Gray City". The New York Times. Retrieved May 22, 2010. ^ "RAV Vast drum. Easy and enjoyable tongue drum". ravvast.com. Retrieved April 24, 2018. ^ (in Russian) В центре Перми появился бурый медведь — РИА «Новый Регион». ^ "Perm State University". Psu.ru. Archived from the original on November 25, 2012. Retrieved April 23, 2013. ^ "Заставка - Пермский государственный технический университет". Pstu.ru. Retrieved April 23, 2013. ^ "Государственный университет - Высшая школа экономики". Hse.perm.ru. Retrieved April 23, 2013. ^ "Perm State Agricultural Academy". Pgsha.ru. Archived from the original on June 6, 2014. Retrieved April 23, 2013. ^ Site developed by Perm RCI PSTU. "Perm State Ballet college". Balletschool.perm.ru. Retrieved April 23, 2013. ^ "Perm, Russia Köppen Climate Classification (Weatherbase)". Weatherbase. Retrieved November 13, 2018. ^ "Pogoda.ru.net" (in Russian). Weather and Climate (Погода и климат). Retrieved December 8, 2015. ^ "Perm Climate Normals 1961–1990". National Oceanic and Atmospheric Administration. Retrieved December 8, 2015. ^ "Oxford's International Twin Towns". Oxford City Council. Archived from the original on August 17, 2013. Retrieved September 3, 2013. Законодательное собрание Пермской области. Закон №416-67 от 28 февраля 1996 г. «Об административно-территориальном устройстве Пермского края», в ред. Закона №504-ПК от 9 июля 2015 г. «О внесении изменений в Закон Пермской области "Об административно-территориальном устройстве Пермского края"». Вступил в силу с момента опубликования. Опубликован: "Звезда", №38, 12 марта 1996 г. (Legislative Assembly of Perm Oblast. Law #416-67 of February 28, 1996 On the Administrative-Territorial Structure of Perm Krai, as amended by the Law #504-PK of July 9, 2015 On Amending the Law of Perm Oblast "On the Administrative-Territorial Structure of Perm Krai". Effective as of the moment of publication.). Законодательное собрание Пермской области. Закон №2038-446 от 11 февраля 2005 г. «Об утверждении границ и о наделении статусом муниципального образования "Город Пермь" Пермского края», в ред. Закона №499-ПК от 16 октября 2009 г «О внесении изменений в отдельные законодательные акты Пермской области и Коми-Пермяцкого автономного округа». Вступил в силу через десять дней со дня официального опубликования (12 марта 2005 г. ), за исключением отдельных положений, вступивших в силу в иные сроки. Опубликован: "Российская газета", №41, 2 марта 2005 г. (Legislative Assembly of Perm Oblast. Law #2038-446 of February 11, 2005 On Establishing the Borders and on Granting the Status to the Municipal Formation of the "City of Perm" of Perm Krai, as amended by the Law #499-PK of October 16, 2009 On Amending Various Legislative Acts of Perm Oblast and Komi-Permyak Autonomous Okrug. Effective as of the day which is ten days following the day of the official publication (March 12, 2005), with the exception of certain clauses, which took effect on different dates.). Законодательное собрание Пермской области. Закон №1868-402 от 1 декабря 2004 г. «Об утверждении границ и о наделении статусом муниципальных образований Пермского района Пермского края», в ред. Закона №273-ПК от 14 декабря 2013 г. «О внесении изменений в отдельные Законы Пермской области, Коми-Пермяцкого автономного округа, Пермского края». Вступил в силу через десять дней со дня официального опубликования. Опубликован: "Бюллетень Законодательного Собрания и администрации Пермской области", №1, II часть, 27 января 2005 г. (Legislative Assembly of Perm Oblast. 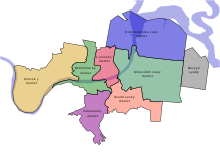 Law #1868-402 of December 1, 2004 On Establishing the Borders and on Granting the Status to the Municipal Formations of Permsky District of Perm Krai, as amended by the Law #273-PK of December 14, 2013 On Amending Various Laws of Perm Oblast, Komi-Permyak Autonomous Okrug, Perm Krai. Effective as of the day which is ten days following the day of the official publication.). ^ "Perm Online". Perm City Forum.